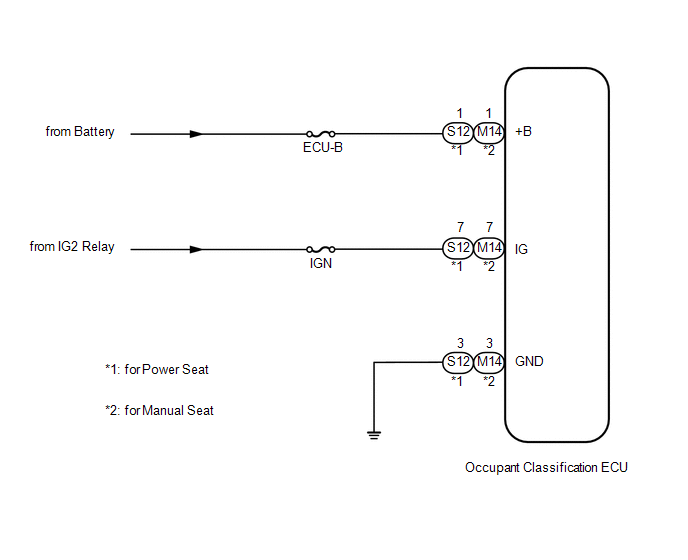 This circuit consists of the occupant classification ECU and power source circuit (battery, fuse and wire harness). DTC B1794 is recorded when a malfunction is detected in the occupant classification ECU or power source circuit. If DTC B1794 is output after turning the ignition switch from off to ON and to off 50 times in a row when a malfunction occurs in the power circuit for the occupant classification system. This DTC is output if a malfunction is detected even after being cleared unless the normal system code is input. The ignition switch is turned from off to ON, hold for 10 seconds or more, and turned off again 50 times in a row when a malfunction occurs in the power circuit for the occupant classification system. When DTC B1650/32 is detected as a result of troubleshooting for the airbag system, check the DTCs stored in the occupant classification ECU. When DTC B1794 is output, perform troubleshooting for the DTC. 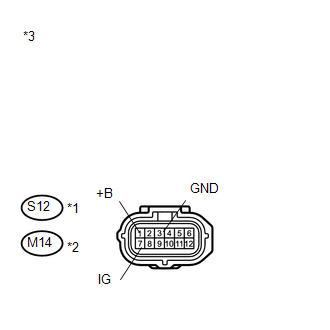 (c) Disconnect the connector from the occupant classification ECU. (c) Connect the connector to the occupant classification ECU. (g) Clear the DTCs stored in the occupant classification ECU (See page ). (h) Clear the DTCs stored in the center airbag sensor assembly (See page ). (j) Turn the ignition switch to ON, and wait for at least 10 seconds. (k) Using the Techstream, check for DTCs of the occupant classification ECU (See page ). DTC B1794 is not output. Codes other than DTC B1794 may be output at this time, but they are not related to this check.